At the moment, the heavyweight division continues registering some of the biggest news in the sport of boxing. This coming Saturday night, IBF/WBA/WBO heavyweight champion Anthony Joshua will look to defend his titles when he faces a very stiff test in former champion Alexander Povetkin. It’s been a hard past few years for Povetkin, who lost a lot of momentum after testing for positive for two separate performance-enhancing drugs (PEDs) in the span of a year. But that doesn’t change the fact that the 39-year old is a dangerous man with a wealth of experience heading into the contest. Joshua is on a high streak, at 21-0 with 20 knockouts, and is looking to cement his name a the top dog in the division. A win over Povetkin (34-1, 24 KO’s) will go a long way to helping that case, but ultimately it will take Joshua defeating the winner of the forthcoming Deontay Wilder vs. Tyson Fury showdown to prove his point. But what is the latest with Wilder vs. Fury. Already the two men have done themselves well by igniting much interest in their fight, and now things appear to be inching close to reality. Looks now as though the WBC champion Wilder (40-0, 39 KO’s) will likely be meeting Fury (27-0, 19 KO’s) inside of the ring on December 1, but it won’t be going down in Las Vegas as initially expected. According to a report from Lance Pugmire from the LA Times, it now looks like Wilder vs. Fury could be heading to the Staples Center in Los Angeles. And already there seem to be a pair of title fights lined up on the undercard. Rumors have it that Leo Santa Cruz (35-1-1, 19 KO’s) could be facing Gary Russell Jr. (29-1, 17 KO’s) in a dream featherweight matchup and surely exceeds beyond just a title belt. Ideally the winner of that fight can claim themself as the best in the featherweight division. Along with Santa Cruz vs. Russell, it also looks like WBA junior lightweight champion Gervonta Davis (20-0, 19 KO’s) vs. Three-division champion Abner Mares (31-3-1, 15 KO’s) could also be happening. Although it should be noted that Mares, 32, has some wear and tear, coupled with an apparent size disadvantage, that would make him a big underdog. Apparently Barclays Center in Brooklyn, a place where Wilder has often fought, is out of the running on that date, as Michelle Obama has a speech schedule there that evening. And the T-Mobile Arena in Las Vegas is booked on the same day with a Justin Timberlake concert. Pretty interesting news, and word on the street is that we can expect an official presser to announce the fight to take place on either this coming Monday or the next. We are nearing a two-month deadline to December 1, and everyone knows each man will want to be locked up in training camp after that fight. Lots of moving parts. 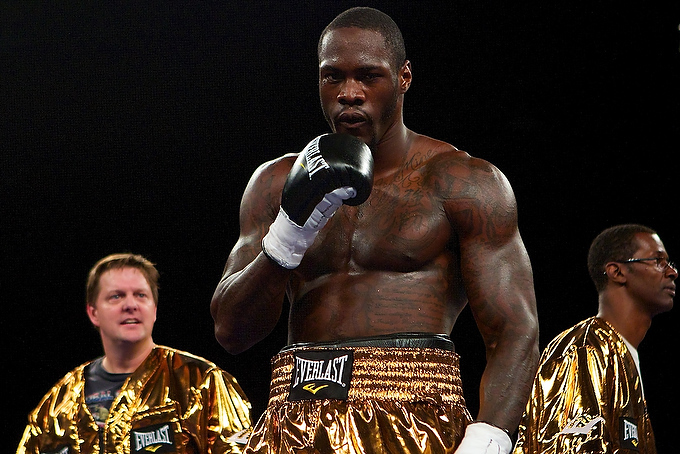 In the next few days we’ll have a winner on Joshua vs. Povetkin, as well as some hopeful news on Wilder vs. Fury.